Deborah Levy’s Things I Don’t Want to Know, a powerful essay which combines biography, politics and a response to George Orwell’s Why I Write. Interesting – perhaps – that those are all non-fiction, where my reviewed choices below are all-but-one fiction. Do I find it easier to review novels? The books below were all read, or re-read, by me this year, and are listed alphabetically by author. No surprise that I rate the book which gave me my online identity. This is the book which proved that Amis was not just a writer of short comic novels: he was also a writer of long comic novels. The voice he developed for John Self is a miracle of sustained attention to detail. Money is one of those books where it’s clear the author sweated over every single word. And it was worth it. I expected this book to be all over the prize shortlists and end-of-year roundups, but it seemed to slip quickly from view after publication early in the year. Perhaps it was the conscious elusiveness of the story, screaming allegory from every page but never quite being nailed down. That was one of the reasons I liked it so much. New work from Crumey is always a delight, though he makes us wait – 5 years since Sputnik Caledonia. Once again he has evaded expectations with a novel which is less immediately lighthearted than most of his previous books, but just as provocative, containing parallel worlds, ideas on art and mass culture, and guest appearances from Walter Benjamin, Hannah Arendt and Theodor Adorno. This is a book with an unforgettable twist or two, one in the very last sentence, but which only gains in power when re-read. It is full of strange wonders, not least how so much is packed into so few pages, and how a book so ultimately unknowable can at the same time be as clear as the water its ‘hero’ lives in. If the only Golding you have read is Lord of the Flies, try this. One of two debuts on my list, and the only non-fiction title. The conceit is simple: a psychoanalyst tells us the stories of some of his patients. The results are simple and – to me – enormously affecting accounts of what can go wrong, particularly between parents and children, and how it can be possible to begin to put it right. Another book that I expected to conquer all this year, and which seems to have sunk without trace. Hooper’s second novel is not just a page-turning psychological thriller – though it certainly is that – but also an inquiry into sexuality, male-female relations, and the power of stories. I read it twice and it stood up brilliantly. Lennon, like Hooper, has the gift of telling stories so seductively that it’s easy to overlook how much he makes you think at the same time. Here we get a story of a woman who finds herself living a new life, everything suddenly and unexplainably changed. Perhaps, as with The Examined Life, it was the acute understanding of parenthood that so floored me here. Much-vaunted by critics and at least one prize jury, McBride’s amazing debut is worthy of all the praise. It is the sort of story you simultaneously want to read and to look away from, and the brittle poetry of the language is a perfect vehicle for the familiarly dark events in this Irish family’s life. A short Spark shock which, like Pincher Martin, loses none of its impact when you already know its unforgettable ending. A comedy, like much of Spark’s work, but undeniably grim and odd even by her odd standards. An interesting selection as always John, with much to pique the interest. I’m particularly interested in your mention of Trip to Echo Spring – I found it alternately brilliant and compelling, and deeply flawed and frustrating. I thought On Roads was a delightful book, so I will read the TV follow-up sometime. So strongly has it lingered in mind I was about to express surprise at the absence of Helen deWitt, but she was a 2012-er for you of course. I wanted to read ‘The Examined Life’ as soon as I read the reviews, but it was your recommendation that gave me the final nudge. I am intrigued by the books you review particularly as many of them haven’t appeared on the usual `books of the year’ lists. I would very much like to read Stephen Grosz and Olivia Laing. Three books stood out for me this year: John McGahern’s Memoir, Margalit Scott’s Into the Labyrinth and Elizabeth Strout’s Olive Kitteridge. Man do I love “Money”. I can’t tell you how often I think of Lorne Guyland’s take on his character. “But this man probes deeper. As an Englishman, John, you’ll understand what I’m saying.” So much amazing stuff in that book. A fine list as ever, John. Eimear McBride’s book is truly great, I think, horrible, wrenching and deeply moving. A remarkable achievement. Chloe Hooper: a strange one. I find her style immensely impressive and I thoroughly enjoyed the book: sinister, elegant and compelling. But somehow unsatisfying. And certainly not as memorable as one of your 2012 picks (as mentioned by leroyhunter) which I read at the beginning of the year: Lightning Rods, as unique as McBride’s debut. I agree Crumey and Coetzee wrote great books this year though neither quite made my ‘top ten’. And it’s great to see some fantastic older books in there like Pincher Martin and The Driver’s Seat (possibly Spark’s best). Downloaded Familiar last week – must read it soon, and get round to A Girl is a Half-formed Thing. It’s at this time of year I think of all the books I wish I’d read! 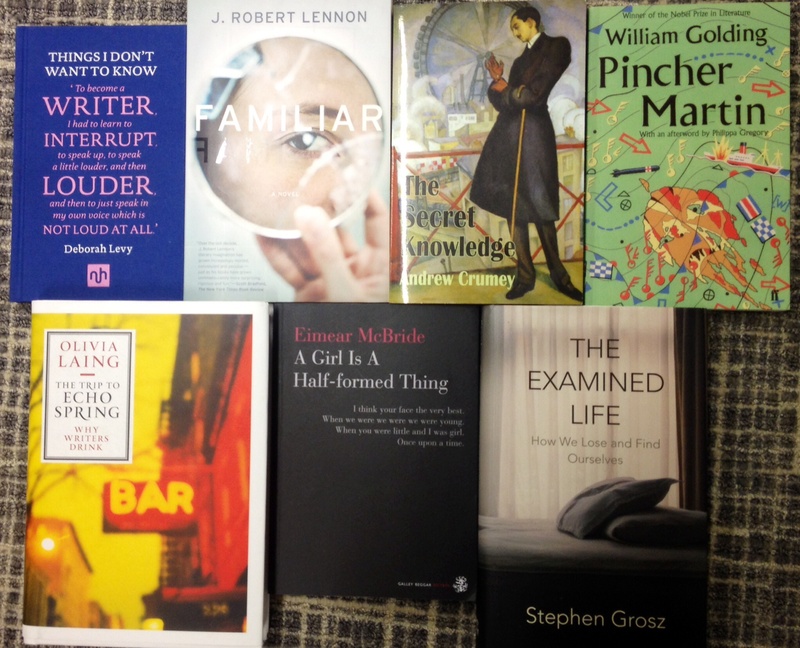 Thanks 1streading – I’d love to know what your top ten does contain, particularly as Crumey and Coetzee didn’t make the cut! Do you have a list somewhere? Didn’t get round to putting my list online. Two of my top five were from Peirene Press – Chasing the King of Hearts and The Mussel Feast; the others were Harvest, The Infatuations and Brief Loves That Live Forever. Did you read / like any of these? I haven’t read any of them! I do like Crace: I’ve read all his books in hardback since Signals of Distress, but for some reason wasn’t tempted by Harvest – possibly in part because I read that he wrote it quite quickly after abandoning his much-vaunted ‘last book’ Archipelago. I’ve read only one Marías, A Heart So White, but will read more of him, so it’s quite possible he would have made my list if I’ve read The Infatuations. I read a few of Peirene Press’s earlier books, which I liked without feeling any strong affection for, so I haven’t taken an interest in their titles since. I have seen much praise for those two titles though, so I may try them. And I’ve never heard of Brief Loves that Live Forever! I’d forgotten the Hooper, like so many others have it seems, so it’s good to be reminded of that. I plan to read The Inheritors before Pincher Martin I think, the subject matter and style just appeal to me. I hadn’t decided on my next Spark (who for some reason reminds me of Bainbridge and Pym, possibly the way they’re all marketed) so I may well make that the next though Memento Mori also tempts. The Grosz I liked, but ultimately I find it a bit slight. Certainly it didn’t trouble my list, but it would be dull if we always agreed.